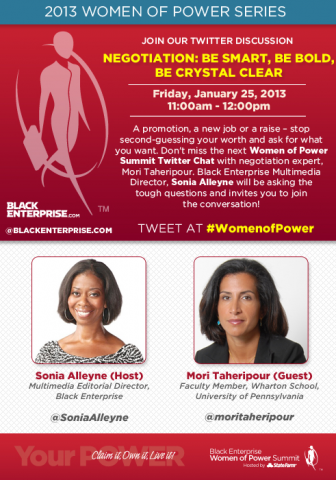 The 2013 Black Enterprise Women of Power Summit is a month away and we are already providing you with plenty of material leading up to the event. If you want to land a promotion, get a raise or find out tips on finding a new job, join the conversation tomorrow at 11 a.m, when host Sonia Alleyne, Multimedia Editorial Director of Black Enterprise, will chat with University of Pennsylvania-Wharton School Faculty Member and Negotiation Expert, Mori Taheripour. Make sure to tweet your questions using the hashtag #WomenofPower. 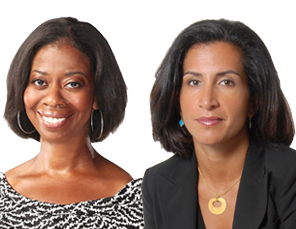 Follow both of our chat participants @soniaalleyne and @moritaheripour on Twitter.